آقانباتی، س. ع.، 1385- زمین‌شناسی ایران، انتشارات سازمان زمین‌شناسی و انتشارات معدنی کشور، 506 ص. حسینی، س. ض.، 1388- کانی‌شناسی، ژئوشیمی و تحولات پتروژنتیکی ولکانیسم پس از تصادم پلئیستوسن، شمال- شمال غرب شهربابک. دانشگاه شهید باهنر کرمان، رساله دکترای زمین‌شناسی- پترولوژی، 238ص. حسینی، س. ض.، 1395- ژئوشیمی، پتروژنز و محیط تکتونیکی جریانات گدازه‌ای مافیک ائوسن سرچشمه، جنوب غرب رفسنجان، فصلنامه علوم زمین، ش 100، ص. 209-220. خلیلی مبرهن، ش. 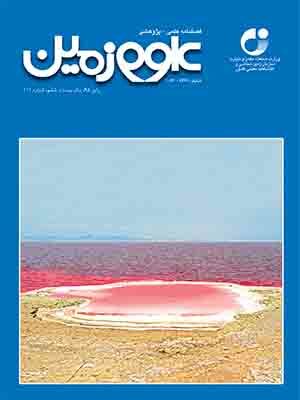 و احمدی‎پور، ح.، 1394- مطالعات رخساره شناسی آتشفشان بیدخوان (استان کرمان)، فصلنامه علوم زمین، ش 95، صص. 111 تا 122. شفیعی بافتی، ب.، 1386- الگوی فلز زایی کمربند مس پورفیری کرمان و رهیافت های اکتشافی آن، کرمان: دانشگاه شهید باهنر کرمان، رساله دکترای زمین‌شناسی اقتصادی، 300 ص. معین‌وزیری ح.، 1383- چند نقطه عطف در تاریخچه تکتونوماگمایی ایران، فصلنامه علوم زمین50-49. Alavi, M., 1994- Tectonics of the Zagros orogenic belt of Iran: new data and interpretations, Tectonophysics, 229: 211–238. Alavi, M., 2004- Regional stratigraphy of the Zagros fold-thrust belt of Iran and its proforeland evolution, American journal of science, v. 304, p. 1-20. Arvine, M. and Rostamizadeh, G., 2000- Geochemical and ptrological characteristics of Deh Siahan granitic rockes, southwest of kerman, Iran: data bearing of genesis. J. Sci. I.R. Iran, 11:117-126. Berberian, F., Muir, I. D., Pankhurst, R. J. and Berbberian, M., 1982- Late Cretaceous and early Miocene Andian type plutonic activitiy in northern Makran and central Iran. J. Geol. Soc. London., 139: 605-614. Berberian, M. and King, G. C. P., 1981- Towards a paleogeography and tectonic evolution of Iran, Can. J. Earth Sci., 18: 210–265. Castillo, P. R., 2006- An overview of adakite petrogenesis. Chinese Science Bulletin 51, 257-267. Defant, J. and Drummond, S., 1990- Derivation of some modern arc magmas by melting of young subducted lithosphere. Nature, 374, 662-665. Defant, M. J. and Kepezhinskas, P., 2001- Evidence suggests slab melting in arc magmas. EOS Trans., 20, American Geophys. Union, Washington,DC., 82: 67-69. Dimitrijevic, M. D., 1973- Geology of Kerman region. Geol. Surv. Iran, Yu/52 ,334 pp. Drummond, M. S., Defant, M. J. and Kepezhinskas, P. K., 1996- Petrogenesis of slab-derived trondhjemite-tonalite-dacite/adakite magmas. Transactions of the Royal Society of Edinburgh. Earth and Enviromental Science 87: 205-215. Gahsemi, A. and Talbot, C. J, 2006- A new tectonic scenario for Sanandaj-Sirjan zone (Iran). J asian Earth Sci., 26: 683-693. Guo, Z., Wilson, M., Liu, J. and Mao Q., 2006- Post-collisional, Potassic and Ultrapotassic Magmatism of the Northern Tibetan Plateau: Constraints on Characteristics of the Mantle Source, Geodynamic Setting and Uplift Mechanisms. J. petrol. 47: 1177-1220. Hassanzadeh, J., 1993- Metallogenic andtectonoömagmatic events in SE sectore of thecenozoic active continental margin of central Iran-Shahr- Babak, Kerman province, PHD thesis, University of California 201 p.
Irvine, T. N. and Baragar, W. R. A., 1971- A guide to the chemical classification of the common rocks, Can. J. Earth Sci., 8, 523-48. Kaviani, A. Paul, A. Bourova, E., Hatzfeld, D., Pedersen, H. and Mokhtari, M., 2007- A strong seismic velocity contrast in the shallow mantle across the Zagros collision zone (Iran), Geophys. doi: 10.1111/j.1365-246X .2007. 03535.x. Le Bas, M. J., Le Maitre, R. W., Streckeisen, A. and Zanettin, B., 1986- A chemical classification of volcanic rocks based on the total alkali-silica diagram. J. Petrol, 27: 745-750. Le Maitre, R. W., Streckeisen, A., Zanettin, B., Le Bas, M. J., Bonin, B., Bateman, P., Bellieni, G., Dudek, A., Efremova, S., Keller, J., Lamere, J., Sabine, P. A., Schmid, R., Sorensen, H. and Woolley, A. R., 2002- Igneous rocks: a classification and glossary of terms, recommendations of the international union of geological sciences, subcommission of the systematics of igneous rocks. Cambridge University Press 15: 521-662. Machado, A. T, Chemale, Jr. F., Conceicao, R. V., Kawaskita, K., Morata, D., Oteıza, O. and Schmus, W. R. V., 2005- Modeling of subduction components in the Genesis of the Meso-Cenozoic igneous rocks from the South Shetland Arc, Antarctica. Lithos, 82(3-4): 435–453. Maniar, P. D. and Piccoli, M., 1989- Teconic discrimination of granitoids. Geological Society of America Bulletin 110: 6642. McQuarrie, N., Stock, J. M., Verdel, C. and Wernicke, B. P., 2003- Cenozoic evolution of Neotethys and implications for the causes of plate motions, Geophys. Res. Lett., 30: 2036, doi: 10.1029/2003GL017992. Miyashiro, A., 1974- Volcanic rock series in island arcs and active continental margins. American Journal of Science, 274, 321-355. Mohajjel, M., Fergusson, C. L. and Sahandi, M. R., 2003- Cretaceous-Tertiary convergence and continental collision, Sanandaj-Sirjan zone wester Iran. J Asian earth sci., 21: 387-412. Nelson, S. T. and Montana, A., 1992- Sieve- texture plagioclase in volcanic rocks production by rapid decompression. Am. Min., 77: 1242 _ 1279. Pearce, J. A., 1983- Role of the sub-continental lithosphere in magma genesis at active continental margins. In: Hawkesworth, C.J., Norry, M.J. (Eds. ), Continental Basalts and Mantle Xenoliths, Shiva, Cheshire, UK, pp. 230±249. Seghedi, I., Downes, H., Szakacs, A., Mason, P. R. D., Thirlwall, M. F., Rosu, E., Pecskay, Z., Marton, E., Panaiotu, C., 2004- Neogene-Quaternary magmatism and geodynamics in the Carpathian-Pannonian region: a synthesis. Lithos. 72, 117-146. Sun, S. S. and McDonough, W. F., 1989- Chemical and isotopic systematics of oceanic basalts: implications for mantle composition and processes. In: Saunders, A. D., Norry, M. J. (Eds.). Topuze, G., Okay, A. I., Altherr, R., Schwarz, W. H., Siebel, W., Zack, T., Satlr, M. and Sen, C., 2011- Post - collisional adakite-like magmatism in the Agvanis massif and implications for the evolution of the Eocene magmatism in the eastern Pontides (NE Turkey). Lithos 125: 131-150. Wilson, M., 2007- Igneous Petrogenesis. Springer Verlag, london, 466 pp. Yilmaz-Sahin, S., Aysal, N. and Gungor, Y., 2012- Petrogenesis of late Cretaceous adakitic magmatism in the Istanbul zone (Cavusbasi granodiorite, NW Turkey). Turkish Journal of Earth Sciences 21: 1029-1045. Zhu, D. C., Zhao, Z. D., Pan, G. T., Lee, H. Y., Kang, Z. Q., Liao, Z. L., Wang, L. Q., Li, G. M., Dong, G. C. and Liu, B., 2009- Early cretaceous subduction-related adakite-like rocks of the Gangdese Belt, southern Tibet: Products of slab melting and subsequent melt–peridotite interaction?, Journal of Asian Earth Sciences 34 : 298–309.